Not sure if you guys can tell, but this post marks the first with a new lens I just purchased on Friday! The photos are so much sharper, don’t you think? In many of my photos before this using my old lens, I noticed that only certain parts of myself would be in focus, while other parts were distorted. This new lens seems to have taken care of that issue! I’m very pleased with it and can’t wait to play with it more this weekend when I’m in Salt Lake City! Another new item I picked up last week is this pretty beaded tassel necklace by HipChik – don’t you love it? It’s just the touch of sparkle I can add to my everyday outfits without making too big of a statement. I picked it up at Calypso in Preston Center, where I also snagged this tassel-accented aztec skirt. Can you tell I have a tassel obsession? A few other tasseled pieces I have on the brain include this Chan Luu necklace, these Eddie Borgo earrings, and this ombre pair by Oscar de la Renta. Another thing I’ve gotta mention is that almost my entire outfit is marked down – definitely don’t want to miss out on these great deals! Happy Monday! Black and white is always stylish! Yessss I see the difference these lens are awesome. Love the b&w look, cute necklace. Love that necklace! The outfit is perfect for late summer. Black & white chic – love this look! Also your hair is getting SO long!! the photos look great! and now you have me wanting a new lens, ahh! That polka dot clutch is so charming and chic! I love this crisp and fresh black and white look! congrats on the new lens. I need to make this same investment if I could just stop buying clothes, shoes, and bags for a few months. Love the black & white, and that this is such a cute clutch. I am all about tassel’s – from necklaces and earrings to skirts and dresses, I love them! Very pretty necklace and outfit. You can never go wrong with black and white! Love the black and white combo, Please do tell what new lens you are using, the camera nerd in me must know!! Love that polka dot clutch and the flat sandals! And the amazing David Yurman ring! Nice necklace. I also like the skirt you have on you’re wish list, the rust and navy looks great together. Have fun on your trip. Photos look great! Love the outfit. Love this look! That bag is adorable and your sandals are perfection! Loving this look! Beautiful tassel necklace. Love the clutch and the sandals, beautiful. Gorgeous! Love the quality of the lens. Which one did you get btw? Do you follow me: http://www.newyorkparigimilano.blogspot.it/2014/08/miroslava-dumas-style.html?? The new lens really sharpens the images! Looking forward to seeing all the new photos with it. Wonderful outfit. Your hair game is on point. I love it. Congrats on the new lens. This outfit is so cute, and the cape in the last post is unreal! Love it! My fav… black and white!!! The necklace is perfectly paired with your DY ring!! Love a great look at a fraction of the price! 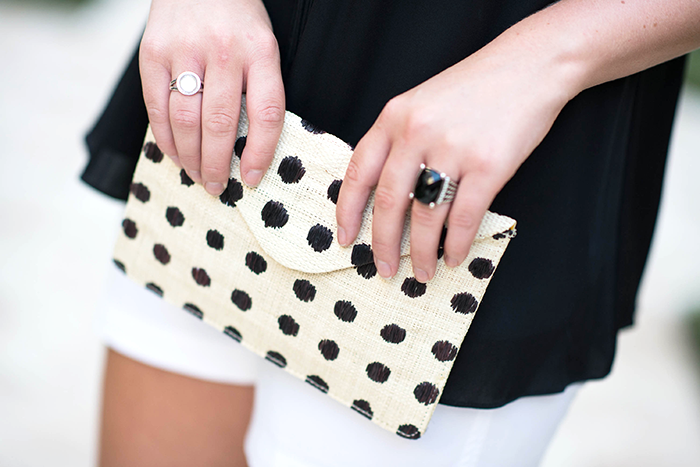 I love the chic simplicity of black and white, and the polka dot clutch is the perfect touch!